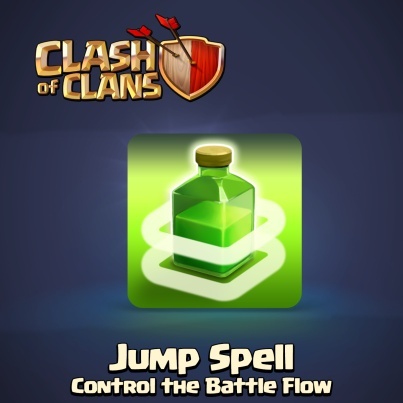 The Jump Spell is one of many Spells in the Clash of Clans game. Walls slowing you down? Try making a shortcut! The level 1 Jump Spell allows all Troops and Heroes to jump Walls. Upgrading the spell will increase its duration on a battlefield (the level 3 Jump Spell lasts three times as long as the level 1 one). Description of common tactics of usage a Jump Spell during the battle is Here. Jump Spells have no effect whatsoever on air units, as they already ignore Walls since they are flying. This also does not change the behavior of Hog Riders or Wall Breakers in any way. The rings that circulate around the illustration of the Jump Spell is to resemble the action when troops jump over Walls. There seems to be tiny bouncing yellow balls when the Jump Spell is dropped. The spell acts like a better (albeit temporary and more expensive) Wall Breaker. The 17 Jun 2013 update changed the behavior of Jump Spell. Prior to the update, the level 1 Jump Spell only affected Troops that required 4 or less housing spaces (Barbarians, Archers, Goblins, Wizards), with the remainder requiring level 2 to jump Walls. As of 17 Jun 2013, all Troops are able to use a level 1 Jump Spell, with level 2 doubling the spell’s duration. As in the 3 Jul 2014 update, the Jump Spell adds a better “battle flow.” If Troops sense a better route, they will now walk over to the Jump Spell, so if they are close by, they can still walk over to the Jump Spell, even if they were not there when first placed. In other words, the old Jump Spell determines the area of troops that can jump over Walls, while the new Jump Spell determines the area of Walls that can be jumped over. Although the Jump Spell can be upgraded to level 2 in the level 6 Laboratory, only Troops and Spells that are already unlocked will appear in the Laboratory upgrade interface. 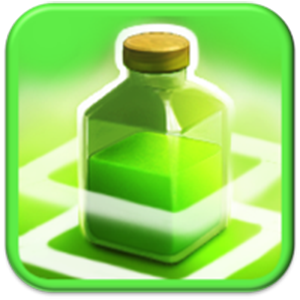 The Jump Spell will not appear in the Laboratory until the Spell Factory has been upgraded to level 4 (which requires Town Hall level 9). Most players already have a level 7 Laboratory by that time; if so, the first upgrade will be available as soon as the Spell Factory level 4 upgrade finishes. The brew time used to be 45 minutes, as of the 1 July 2015 update it has been reduced to 30 minutes.